Bonjour...what a shocker! Yep..a car ride to Annie's house! We were greeted by blondie. Oh I love her...attention all weekend. Hugs, kisses, massages....Get the toys Lily. We played and played ball with Annie and the lady. The lady threw the ball and we would chase it. Yep, I am light on the feet huh? Nice action shots by the puparrazzi. I was grateful that scary hand didn't try and get me. I think the hand was hiding under the deck or something. Annie is taking a time out. Okay...Annie lives with kkkkkkk..kittys, Oscar and Phoebes. I almost could not get the word out. My favorite lady teased my Lily. Do you believe it. See her hiding in the door? My Lily was screaming trying to save blondie from Oscar..but it didn't work. Come on Lil, blondie or Oscar doesn't mean any harm. Follow me Lily. We went inside and kitty cat hunted before our nap. Aaaaaaaa...oh Lilyyyyy. Did I scare ya? Fun post! I felt like I was there!! Watch out for those kitties!!! I love those photos of you running at full speed! You two must have been tired after such a fun day! Wish we were there to play with ya. I love those cool action shots!!! Can you make friends with the kitties? They look really cute! Looks like you had a great day even with those kitties.. Great action shots..
What a great and funny post dearf friends!!!! Looks like you had a wonderful and exciting day!!!! Soooooooo many friends...and kitties to!!!! Are you friends of Kitties???? Pay attention to those strange creatures!!!! Sure you'll have a sweet night after all your running!!!!! You two looked like you were really enjoying yourselves! Cats didn't look quite as happy!! What a great play date you had. Mommy loves the paw action shot. I don't know about those kittys be careful. What a fun day the two of you had! We love all of the action shots! That Annie looks like the same size as my Mason. May I recommend hanging off her lips? It's great fun, really! I am tired just watching you two!! What fun!! Did woo get up on the khounter too? Sure you had a pawesome day... cats included! So much action in one day. You two got super bouncy and all running around like maniacs. What's up with those cats? Don't they know who you are? Hi, Did that look like fun! 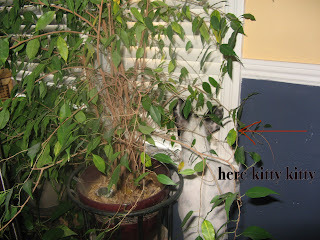 The little kitties are cute to play with and they certainly have a good watch dog to look after them! I can see why you were sleeping at the end of a long fun day! Have a great day! I'm hope your all rested by now! Looks like you two had a rip-roarin' good time!